Dragon shouts (a.k.a. The Voice or Thu'um) are phrases of dragon language, consisting of three separate words of power, that can be used to unleash varied powerful effects. Dragons are naturally able to use dragon shouts, but very few people possess this capability. As the Dovahkiin (Dragonborn), a mortal with the soul of a dragon, you were born with this power. You can use dragon shouts only after completing Dragon Rising in the Main Quest, from which point you can absorb a dragon's soul after slaying it. You can learn a total of 20 dragon shouts in the standard version of Skyrim, but that number can be increased to 27 dragon shouts by installing official add-ons. The Dawnguard add-on adds three new dragon shouts for players, while Dragonborn adds a total of four new dragon shouts. Discover and approach a word wall to learn a word of power. Unlock the word by selecting or hovering over it, and pressing R (PC), (Xbox), or (PS3). To unlock a word, you must use a dragon soul that you have absorbed. If you have no dragon souls available, you must kill a dragon and absorb its soul. Over the course of the main questline, you will learn 15 words of power from several characters. These words are immediately unlocked when you receive them. You will need 44 additional dragon souls to unlock all the remaining words available. When you unlock the first word of a dragon shout, you will have access to its most basic version. Unlocking the shout's second and third words will allow for the use of a more powerful shout that will last longer, deal more damage, or have additional effects. However, certain shouts will have no effect at all unless all three words have been unlocked and are spoken at once. If you use a dragon shout in towns, inhabited dungeons or encampments, a courier may afterwards locate you in an outdoor area and give you a Letter from a Friend which will make available a miscellaneous quest leading to a word wall. Couriers will continue delivering such letters until all currently available words of power have been learned. However, you will not receive a new Letter from a Friend until you have completed the quest associated with the previous letter so received. Once you have completed The Horn of Jurgen Windcaller, you can seek out Arngeir in High Hrothgar to ask him if the Greybeards have found the locations of any words of power. He will direct you to a word wall by marking it on your map, which starts a miscellaneous quest. When you have learned all currently-available words, Arngeir will stop providing locations. Dragon shouts are, in many ways, similar to Magic but their use is not restricted by any stats or skills. To use a shout, it must first be selected from the Shouts or Favorites menu (only one shout or Power can be selected at a time). The shout can then be used by pressing the Dragon Shout/Power button. Once the second and third words of a shout are unlocked, the shout can be "charged" by holding the shout button down. Tapping the shout button will unleash the weakest version of the shout, holding it down briefly will release the middle version, and simply holding the button will unleash the most powerful available version of the shout. Once the shout is fully charged, your character will release it automatically. Using a shout will trigger a cool down time in which additional shouts cannot be used. The amount of time left in the cool down period can be seen as a blue outline around the compass at the top of the screen. Once the outline has receded completely, a shout can be used again. Shout cool down times vary greatly, but using more words of the shout will always make the cool down longer, with the exceptions of Throw Voice, Dragon AspectDB, and Call of Valor. The effects from the Amulet of Talos, Blessing of Talos, and Dragon AspectDB shout reduce the cool down period and can be stacked. Meditation on a word of power with Paarthurnax and/or powers in Dragonborn can increase the power of certain shouts as well. Shouts have a variety of uses both in and out of combat. Some shouts are simply helpful in traversing areas while many others can effectively turn the tide of a battle if used strategically. Since employing a powerful shout will often prevent the use of multiple shouts during a single combat, weighing a shout's effects and magnitude (one, two, or three words) versus its cool down time can help you use shouts more efficiently. The order in which you visit word walls associated with a particular shout does not matter. Word walls will always give you the first word not already learned for a shout. This is also true of the quest-taught words of Whirlwind Sprint, learned in The Way of the Voice, and Fire Breath, learned in The Throat of the World; you will always learn the next word not already learned. Your Voice is not a Shout, but a whisper, revealing the life forces of any and all. Your Thu'um enchants your nearby allies' weapons, allowing them to attack faster. The Thu'um reaches out to the Void, changing your form to one that cannot harm, or be harmed. Your voice bends the very stones to your will. As it gains power, animals, people, and even dragons must do your bidding. Odahviing! Hear my Voice and come forth. I summon you in my time of need. The valiant of Sovngarde hear your Voice, and journey beyond space and time to lend aid. Skyrim itself yields before the Thu'um, as you clear away fog and inclement weather. Your Thu'um creates a whirling cyclone that sows chaos among your enemies. Shout defies steel, as you rip the weapon from an opponent's grasp. And the weak shall fear the Thu'um, and flee in terror. Once a day, take on the mighty aspect of a dragon, delivering colossal blows, with an armored hide, and more powerful shouts. Your Voice lashes out at a dragon's very soul, forcing the beast to land. Coax both magical and mortal energies from your hapless opponent. Inhale air, exhale flame, and behold the Thu'um as inferno. Your breath is winter, you [sic] Thu'um a blizzard. Your Thu'um freezes an opponent solid. The Voice soothes wild beasts, who lose their desire to fight or flee. Speak, and let your Voice herald doom, as an opponent's armor and lifeforce are weakened. Shout at time, and command it to obey, as the world around you stands still. Your Thu'um cuts through flesh and shatters soul, commanding the will of the fallen. Durnehviir teaches you a word each time you summon him from the Soul Cairn. A Shout to the skies, a cry to the clouds, that awakens the destructive force of Skyrim's lightning. Durnehviir! Hear my Voice and come forth from the Soul Cairn. I summon you in my time of need. The Thu'um is heard, but its source unknown, fooling those into seeking it out. Your Voice is raw power, pushing aside anything - or anyone - who stands in your path. The Thu'um rushes forward, carrying you in its wake with the speed of a tempest. Alduin has a dragon shout named "Dragon Storm Call". It is similar to Storm Call, but it calls forth a meteor storm instead of a lightning storm and the sky turns red instead of stormy gray. Alduin used this shout to destroy Helgen. Clear Skies interrupts the storm. Alduin has another shout called "ResurrectionShout" that resurrects dead dragons. Its words of power are "Slen Tiid Vo", which translate to "Flesh Time (Opposite of)". It should be noted that you can learn the words Tiid (Time) and Slen (Flesh), showing that words can be part of different shouts. The soul-snare mist created by Alduin in Sovngarde is technically not a dragon shout, but a script. It creates a mist where Alduin hides and feeds upon the trapped souls. Its words of power are "Ven Mul Riik", which translate to "Wind Strong Gale". The shout used by Tsun to return you to Nirn from Sovngarde is another unavailable shout. Its words of power are "Nahl Daal Vus"; its first two words translate as "Living Return". 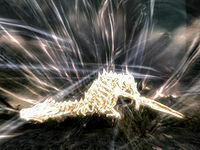 The shout used by the Greybeards to create ethereal forms for you to practice shouts on is called Phantom Form‎. Its words of power are "Fiik Lo Sah", which is translated as "Mirror Deceive Phantom". The shout was apparently intended to be available, as it is voiced for all races. During the learning of Whirlwind Sprint, Borri opens the gate doors by saying "Bex", meaning "Open". This is not a shout, but a script. Dwarven Centurions have a "Steam Breath" power that is treated as a dragon shout by the game engine. The closest thing you can obtain to this is the lesser power Breath of Nchuak, added by Dragonborn and only available with the Visage of Mzund equipped. Dawnguard adds Soul Cairn Summon, a shout unique to Durnehviir. Its words of power are "Diil Qoth Zaam", translated as "Undead Tomb Slave". Each word summons an undead minion from the Soul Cairn; the full shout will summon a wrathman, boneman, and mistman to aid Durnehviir in combat. These summons are available to you, but rather in spell form. Even if you obtain this shout with console commands, you can only summon one undead unless you use the console to add the multiple summon perk that Durnehviir has. You can absorb one dragon soul without fighting a dragon after finishing the quest The Horn of Jurgen Windcaller. The souls MiraakDB stole from you throughout the game will be returned when you kill him during the quest At the Summit of Apocrypha. If you use a dragon shout in a city while there are no hostile opponents present, a guard may run up to you and ask you to stop, complaining that the villagers are getting nervous; however, there are no other consequences, regardless of the dialogue option chosen or whether you continue to shout. This is true even for shouts that are not supposed to reveal your location to others, such as Aura Whisper or Throw Voice, or for shouts that have no effect, such as Elemental Fury without an equipped weapon. The male human shouts (Breton, Nord, Imperial, and Redguard) were voiced by Mark Lampert, the game's sound designer. The following NPCs are able to use dragon shouts: all members of the Greybeards, Ulfric Stormcloak, the Ebony WarriorDB, and MiraakDB. All dragons, some draugr and draugr deathlords can also use the Voice. Arngeir may not give you the option to ask him for words of power. Sometimes, the word will not appear on the wall, leaving you unable to learn the entire shout. There does not appear to be a fix for this; even loading from a previous save will not cause the word to appear. Associated audio and visual effects may be present, but you will not learn the word. The audio will continue to play every time you visit the site. It is possible that the word will become available at the wall if the area is left unvisited for a long period of time. One fix is using the console command player.teachword wordid -- however, this will not finish related quests. For the teachword command, you need the id of each shout's individual word of power, not the id posted in the table here, and they can be found on each shout's individual page. Using the command SetStage FreeFormHighHrothgarA 20 will end The Words of Power and allow you to acquire another quest normally. This only ends the quest; you will still need to use the teachword command to learn the shout. Some of the sound files do not match the words of some shouts. For example, the female Khajiit voicing for "Marked For Death" is only "Krii!" for the single tap version (one word) - the 3 word version comes out "Yun Lud Aus!" instead. Sometimes when you kill a dragon, it will die and its body will be lootable, but you will not absorb its soul. This is usually the result of a dragon you already killed earlier respawning. If a shout is activated while in the water where you can't use it, then it will activate as soon as you would be able to (as soon as the water becomes shallow); however, no matter what words of the shout you know or how long you hold it, it will always cast the weakest version. If a shout is activated while holding a drawn bow, then it will activate as soon as you would be able to (once you're finished sheathing/firing your bow); however, no matter what words of the shout you know or how long you hold it, it will always cast the weakest version. ? The first word of clear skies, "Lok", sounds the same regardless of race or gender. ? Using the soul of a dragon to unlock a shout while the animation for the soul absorption is still playing will grant you another soul after the "dragon soul absorbed" message appears. ? Achievements related to dragon shouts are listed below. This achievement is unlocked during Dragon Rising, since it is the first quest where a dragon can be killed. Any twenty dragons can be killed to obtain this achievement. You can track your progress towards this achievement using the "Dragon Souls Collected" statistic, on the "Magic" page of your journal's "General Stats" section. Most players will unlock this achievement at the end of The Horn of Jurgen Windcaller, when the final word of Unrelenting Force is learned from the Greybeards. However, it can also be unlocked by visiting all three word walls for any given dragon shout. Shearpoint has all three words of the Throw Voice shout. To unlock this achievement, one word of each of the twenty available shouts must be unlocked (learning any twenty different words of power is not sufficient). It cannot be unlocked until the main quest is completed, because several of the shouts are only learned as part of the main quest — and one shout (Call of Valor) is only learned at the completion of the final quest, Dragonslayer. This is no longer the case with the release of the add-ons as other shouts are now available. The other shout that is easy to miss for this achievement is Throw Voice, since it can only be learned in one location, Shearpoint. You can track your progress towards this achievement using the "Shouts Learned" statistic, on the "Magic" page of your journal's "General Stats" section. This page was last modified on 12 July 2018, at 16:07.